When you think of Annandale, VA, you think Korean food. The usual suspects of various grill joints, tofu houses, bakeries and grill joints next to bakeries. Then the occasional Japanese establishments and Peruvian chicken gigs (which, by the way, is a taste of heaven, especially in Annandale). Just the thought of coming face to face with authentic Chinese noodle soups…not the kind you find in shopping mall food courts, but the real deal with local feel. The rule of thumb is, go where the locals go. The Korean grill joint where Koreans flock to, must be something there. The pho house that the Vietnamese gather in, must be doing something right. That’s the case at A & J in Annandale. My first time around, I tried the peanutty Dian Dian Mein, surprisingly think and spicy (both good things), and the fried chicken noodle soup (perfectly seasoned and fried). 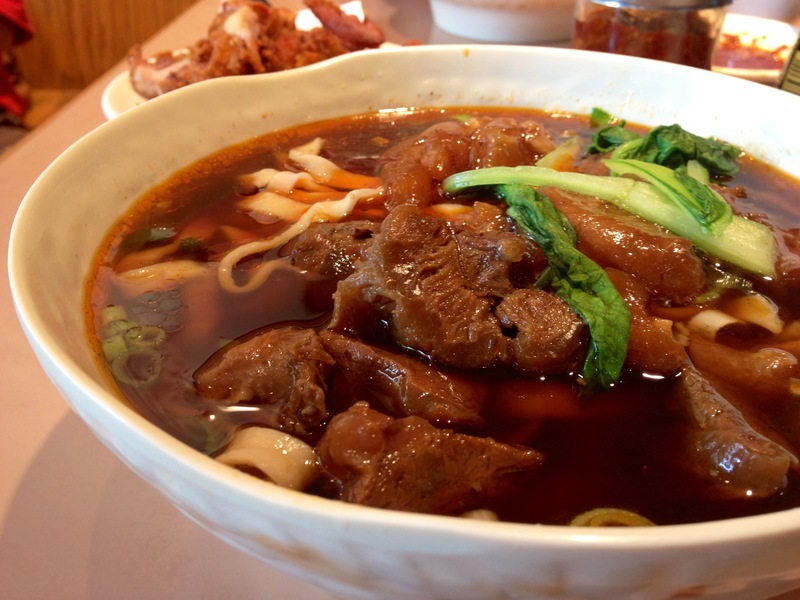 But I had my eye on a dish in particular, the spicy beef and tendon noodle soup, Szechuan style. So began my blissful eating. First, the aroma. It was deep, and I could feel the spices emanating from the broth. Kind of reminiscent of five-spice, but much more complex, even a hint of herbal medicine. I first taste the reddish-brown broth, and that aroma hits my senses in liquid form. Not too oily, but deep in flavor, with all that spice and beefy goodness. The sheer amount of beef and tendons was ridiculous (generosity in portions is a must for me in restaurants). The beef had the perfect fat content to allow it to melt in my mouth, and the tendon was perfectly cooked. The wide noodles matched well with the overall thick flavor. If you’re into the best parts of meat, like innards and tendons, this is a must. Not many have heard of the place. Even the local Koreans are not familiar with it. Inside the quaint food court area of the Lotte Mart in Fairfax, VA, there exists the best Korean-Chinese joint in town, Tian. Most of the Korean-Chinese places are in Annandale or Centreville (like everything else), but most of those joints are overrated. I’ve been a usual at Tian since my law school days, and in particular, I’m a sucker for their jjambbong. What, you say, is that name again? If there is pho in Vietnam, there is jjambbong in Korea. Friends, if you’re like me and have a constant craving for hot soups full of noodles, meat, and seafood, give this a try. The broth can either be seafood or beef based, and if you don’t mind the heat, it is bold and rich in flavor. Not to mention the heaping mounts of mussels, clam and squid, partnered with cabbage and other veggies. It has a strong aroma, a kick from the dried peppers and jalapenos. The broth has a deep flavor of the sea from the mussels and clams. The noodles are silky and perfectly cooked. The meal truly warms your innards on a cold day, and nostalgia takes you away to the port towns of the southern Korean shoreline. 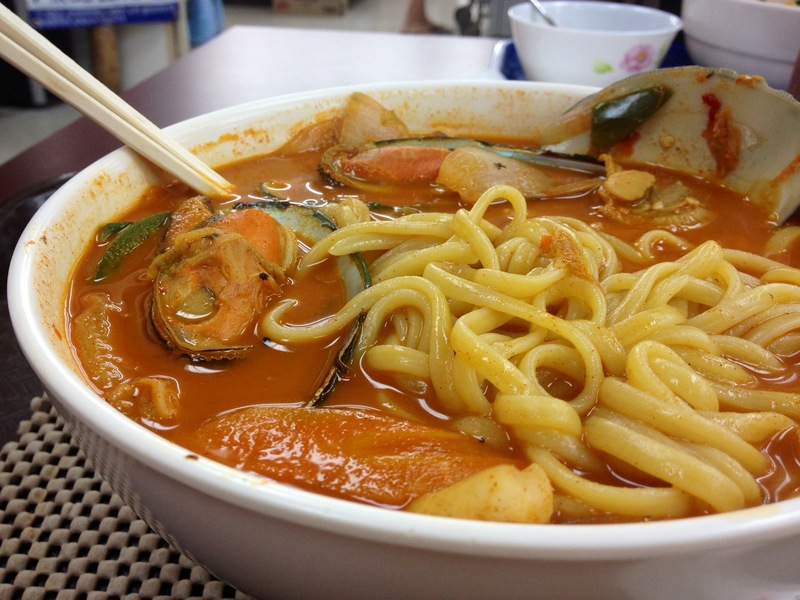 This little-known Korean delicacy is a true contender amongst the world of noodle soups. For those of you who have frequented this blog, I have nothing further to say about pho. Or do I.
It’s something about the fresh bean sprouts, cilantro, and lime that gets me every time. Yes, the beef broth that has simmered for twenty hours is surely divine, and the morsels of meat, tripe and tendon are indescribable. But pho is distinct in this trilogy for its interplay between slow and fast, stewed and fresh. The lively herbiness enhances its flavor triple-fold. 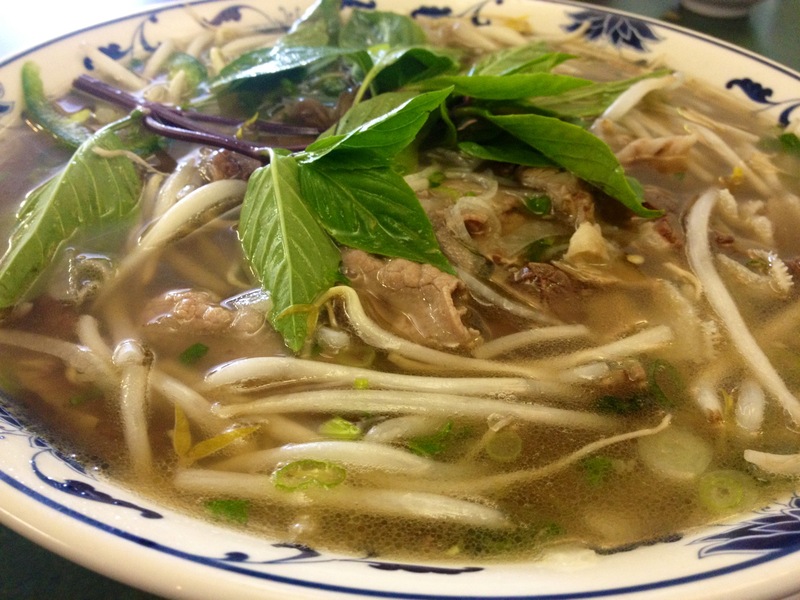 And no, not all pho joints are created equal. In the DC area, I still think Pho 75 is king. But Viet House in Fairfax, VA, is legit. The broth has a deeper flavor, the brisket is soft and has the right fat content, and they are not shy to mount heaps of tripe and tendon, which is what makes a good bowl of pho, great. ‘Twas the end of a perfect road trip with my wife, pounding blue crabs in Annapolis, and what a perfect way to commemorate the weekend. A cold glass of iced coffee with sweet condensed milk, the fresh bean sprouts lightly withering in the steaming broth, the company of my beautiful lady – oh the joys of life. I am proud to say that I had the delightful luxury of consuming the Mein Trilogy in the span of two days. There exists many more gastronomical mysteries yet to be discovered in the noodle soup category, and I am destined to search further and deeper. Join me in this calling.